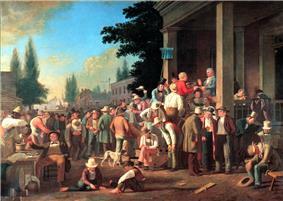 An 1846 painting, The County Election by George Caleb Bingham, showing a polling judge administering an oath to a voter. The United States is a federation, with elected officials at the federal (national), state and local levels. On a national level, the head of state, the President, is elected indirectly by the people, through an Electoral College. Today, the electors virtually always vote with the popular vote of their state. All members of the federal legislature, the Congress, are directly elected. There are many elected offices at state level, each state having at least an elective governor and legislature. There are also elected offices at the local level, in counties and cities. It is estimated that across the whole country, over one million offices are filled in every electoral cycle. State law regulates most aspects of the election, including primaries, the eligibility of voters (beyond the basic constitutional definition), the running of each state's electoral college, and the running of state and local elections. The United States Constitution defines (to a basic extent) how federal elections are held, in Article One and Article Two and various amendments. The federal government has also been involved in attempts to increase voter turnout, by measures such as the National Voter Registration Act of 1993. The most common method used in U.S. elections is the first-past-the-post system, where the highest polling candidate wins the election. Some may use a two-round system, where if no candidate receives a required number of votes then there is a runoff between the two top voted people. Every state except North Dakota requires that citizens who wish to vote be registered. Some states allow citizens to register to vote on the same day of the election, see below. Traditionally, voters had to register at state offices to vote, but in the mid-1990s efforts were made by the federal government to make registering easier, in an attempt to increase turnout. The National Voter Registration Act of 1993 (the "Motor Voter" law) required state governments that receive certain types of federal funding to make the voter registration process easier by providing uniform registration services through drivers' license registration centers, disability centers, schools, libraries, and mail-in registration. States with same-day registration are exempt from Motor Voter; namely: Idaho, Minnesota, New Hampshire, North Dakota, Wisconsin, and Wyoming. In many states, citizens registering to vote may declare an affiliation with a Michigan, Minnesota, Virginia, Wisconsin, and Washington, practice non-partisan registration. A significant source of absentee ballots is the population of Americans living outside the United States. In 1986 Congress enacted the Uniformed and Overseas Citizens Absentee Voting Act (UOCAVA). UOCAVA requires that the states and territories allow members of the United States Uniformed Services and merchant marine, their family members, and United States citizens residing outside the United States to register and vote absentee in elections for Federal offices. Though many states had pre-existing statutes in place UOCAVA made it mandatory and nationally uniform. "Generally, all U.S. citizens 18 years or older who are or will be residing outside the United States during an election period are eligible to vote absentee in any election for Federal office. In addition, all members of the Uniformed Services, their family members and members of the Merchant Marine and their family members, who are U.S. citizens, may vote absentee in Federal, state and local elections." Absentee ballots from these voters can often be transmitted private delivery services, fax, or email. Mail ballots are similar in many respects to an absentee ballot. However they are used for Mailing Precincts where on Election Day no polling place is opened for a specific precinct. In Oregon and Washington, all ballots are delivered through the mail. Early voting is a formal process where voters can cast their ballots prior to the official Election Day. Early voting in person is allowed in 33 states and in the Washington, D.C. with no excuse required. The President and the Vice President are elected together in a Presidential election. It is an indirect election, with the winner being determined by votes cast by electors of the Electoral College. In modern times, voters in each state select a slate of electors from a list of several slates designated by different parties or candidates, and the electors typically promise in advance to vote for the candidates of their party (whose names of the presidential candidates usually appear on the ballot rather than those of the individual electors). The winner of the election is the candidate with at least 270 Electoral College votes. It is possible for a candidate to win the electoral vote, and lose the (nationwide) popular vote (receive fewer votes nationwide than the second ranked candidate). Until the Twelfth Amendment to the United States Constitution of 1804, the runner-up in a Presidential election became the Vice President. Electoral College votes are cast by individual states by a group of electors, each elector casts one electoral college vote. Until the Twenty-third Amendment to the United States Constitution of 1961 the District of Columbia citizens did not have representation and/or electors in the electoral college. In modern times, with electors usually committed to vote for a party candidate in advance, electors that vote against the popular vote in their state are called faithless electors, and occurrences are rare. State law regulates how states cast their electoral college votes. In all states except Maine and Nebraska, the candidate that wins the most votes in the state receives all its electoral college votes (a "winner takes all" system). From 1969 in Maine, and from 1991 in Nebraska, two electoral votes are awarded based on the winner of the statewide election, and the rest (two in Maine, three in Nebraska) go to the highest vote-winner in each of the state's congressional districts. 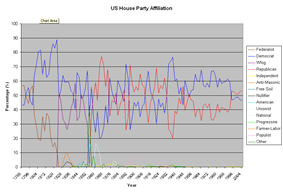 Elections to Congress take place every two years. Congress has two chambers. The Senate has 100 members, elected for a six-year term in dual-seat constituencies (2 from each state), with one-third being renewed every two years. The group of the Senate seats that is up for election during a given year is known as a "Classes of United States Senators"; the three classes are staggered so that only one of the three groups is renewed every two years. Until the Seventeenth Amendment to the United States Constitution in 1913, Senators were elected by state legislatures, not the electorate of states. The House of Representatives has 435 members, elected for a two-year term in single-seat constituencies. House of Representatives elections are held every two years on the first Tuesday after November 1 in even years. House elections are first-past-the-post elections that elect a Representative from each of 435 House districts which cover the United States. Special House elections can occur between if a member dies or resigns during a term. The non-voting delegates of Washington, D.C. and the territories of American Samoa, Guam, the Northern Mariana Islands, Puerto Rico and the United States Virgin Islands are also elected. State law and state constitutions, controlled by state legislatures regulate elections at state level and local level. Various officials at state level are elected. Since the separation of powers applies to states as well as the federal government, state legislatures and the executive (the governor) are elected separately. Governors and lieutenant governor are elected in all states, in some states on a joint ticket and in some states separately, some separately in different electoral cycles. The governors of the territories of American Samoa, Guam, the Northern Mariana Islands, Puerto Rico and the United States Virgin Islands are also elected. In some states, executive positions such as Attorney General and Secretary of State are also elected offices. All members of state legislatures and territorial jurisdiction legislatures are elected, state senators and state representatives/assembly members. Nebraska's legislature is unicameral, so only senators are elected. In some states, members of the state supreme court and other members of the state judiciary are elected. Proposals to amend the state constitution are also placed on the ballot in some states. 2 Both the Governors of New Hampshire and Vermont are each elected to two-year terms. The other 48 state governors serve four-year terms. Americans vote for a specific candidate instead of directly selecting a particular political party. The Ross Perot and Steve Forbes to spend enormous amounts of their own money in their own campaigns. The effect of the second decision was to allow the culture of "soft money" to develop. Changing campaign finance laws is a highly controversial issue. Reformers wish to see laws changed in order to improve electoral competition and political equality. Opponents to reform wish to see the system stay as it is or with even fewer restrictions on the freedom to spend and contribute money. The Supreme Court has made it increasingly difficult for those who wish to regulate election financing, but options like partial public funding of campaigns are still possible and offer the potential to address reformers' concerns with minimal restrictions on the freedom to contribute. In partisan elections, candidates are chosen by primary elections (abbreviated to primaries) and caucuses in the states, the District of Columbia, Puerto Rico, American Samoa, Guam, and the U.S. Virgin Islands. Caucuses also nominate candidates by election, but they are very different from primaries. Caucuses are meetings that occur at precincts and involve discussion of each party's platform and issues such as voter turnout in addition to voting. Eleven states: Iowa, New Mexico, North Dakota, Maine, Nevada, Hawaii, Minnesota, Kansas, Alaska, Wyoming, Colorado and the District of Columbia use caucuses. ^ "Felony Disenfranchisement in the United States" (PDF). The Sentencing Project. Retrieved 2007-01-10. ^ DeFalco, Beth (2007-01-09). "New Jersey to take 'idiots,' 'insane' out of state constitution?". Delaware News-Journal. 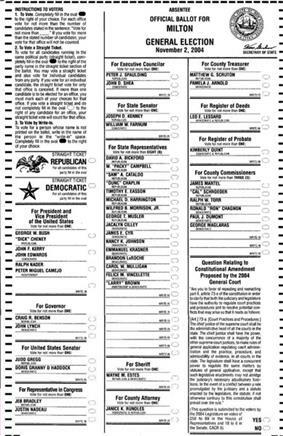 ^ "Voting by Absentee Ballot in Washington state.". ^ "Federal Voting Assistance Program questions and answers". ^ "MAIL (ABSENTEE) BALLOT VOTING". ^ "Absentee and Early Voting". National Conference of State Legislatures. Retrieved November 12, 2014. ^ Statistics on the State of the Nation Before the Presidential Elections (2007 and 2011), Pew Research Center, 2011. ^ In Federalist Papers No. 9 and No. 10, Alexander Hamilton and James Madison, respectively, wrote specifically about the dangers of domestic political factions. ^ Baker, Peter; VandeHei, Jim (2006-11-08). "A Voter Rebuke For Bush, the War And the Right". Washington Post. Retrieved 2010-05-26. Bush and senior adviser Karl Rove tried to replicate that strategy this fall, hoping to keep the election from becoming a referendum on the president's leadership. ^ "Election '98 Lewinsky factor never materialized". CNN. 1998-11-04. Americans shunned the opportunity to turn Tuesday's midterm elections into a referendum on President Bill Clinton's behavior, dashing Republican hopes of gaining seats in the House and Senate. The Federal Election Campaign Act of 1971 required candidates to disclose sources of campaign contributions and campaign expenditure. It was amended in 1974 to legally limit campaign contributions. It banned direct contributing to campaigns by corporations and trade unions and limited individual donations to $1,000 per campaign. It introduced public funding for Presidential primaries and elections. The Act also placed limits of $5,000 per campaign on PACs (political action committees). The limits on individual contributions and prohibition of direct corporate or labor union campaigns led to a huge increase in the number of PACs. Today many labor unions and corporations have their own PACs, and over 4,000 in total exist. The 1974 amendment also specified a Federal Election Commission, created in 1975 to administer and enforce campaign finance law. Various other provisions were also included, such as a ban on contributions or expenditures by foreign nationals (incorporated from the Foreign Agents Registration Act (FARA) (1966). Thus, it is up to the candidate to decide under what party he/she should run, registers to run, pays the fees, etc. In the gerrymander the congressional districts). The party is thus little more than a campaign organization for the main elections.